Call me a big old stick in the mud but I don’t like very many of Thierry Mugler’s fragrances. Okay, stop hurling rotten fruit at me. I said most, not all. Fortunately for Alien, I love it. In Bottle: Alien is a very powerful fragrance, it’s a few notches above Angel and it doesn’t take a whole lot of this to scent the place up. I’m a big fan of jasmine, love the stuff. Would slather myself in it and Alien is like the wish that came true. It takes jasmine and really kicks it up several notches beyond normal to the point that all I smell is metallic jasmine–and that’s while it’s in the bottle. Applied: Powerful burst of metals and jasmine right up top with a hint of peppery spice to sooth the nose a little. I know, pepper soothing a nose? The jasmine in this is really strong that when you end up smelling the pepper it’s almost a relief in a way. The fragrance continues to age with jasmine heading the way and the pepper and its strange metallic friend disappear. A bit of vanilla drives itself into the middle and lends a slight plastic quality to the mid-stage. I’m not a big fan of fake vanilla when I can tell it’s the synthetic kind, but the vanilla here actually doesn’t do too bad against jasmine. It goes well with the whole quirkiness of the scent. It gives it a bit more personality too so it’s not just powerful jasmine. Otherwise, this is pretty, white, with that little dirty quality that’s present in many jasmines. I can’t say much else in the way of Alien, it’s a one trick pony. But what a trick! If you love jasmine you’ll love this. It’s heady, heavy, very present and projects hugely. The dry down sees the introduction of some other notes, namely woods that help calm the jasmine down a bit. 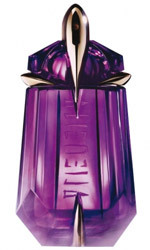 Extra: Alien is like Thierry Mugler’s declaration that if you wanted to graduate into floral territory, you should do it with a huge celebration and a fragrance that shouts. Like with most Thierry Mugler scents, Alien has excellent longevity and fantastic projection. Design: I’m not a huge fan of Thierry Mugler bottle designs either, and Alien’s bottle puts me off a little. It’s purposefully meant to be off-putting, strange, and a bit ridiculous. I can’t say I like the angles, the feel of this thing in my hand, or its pointiness. It’s a great strange little bottle, but it’s not to my tastes. Notes: Jasmine, pepper, vanilla, woods. I’m not a strong, in-your-face fragrance kind of gal. I love the subtle stuff, the stick-to-your-skin kind of fragrance but when I want to go loud, this is the stuff I’m doing it with. Reviewed in This Post: Alien, 2008, Eau de Toilette. This entry was posted in floral, Reviews By House, thierry mugler and tagged jasmine, pepper, vanilla, woods. Bookmark the permalink.